This is a neat little CompactFlash reader from PNY Technologies which connects via USB. It has so far been fast and reliable and has no trouble handling 128Mb CF cards (I expect it will handle bigger, but 128 is the biggest I have). The instructions are in slightly dodgy English, but it is good value for money at less than 30 GBP. One thing I like is that it has an eject button rather than relying on brute force. 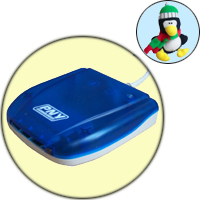 The unit is supplied with 98/2000 drivers and works well with Windows 98 and XP. When plugged in it shows up as a Removable Disk. 98 once threw a wobbly when I left the drive plugged in and with the PC off but with the wall socket on, refusing to boot for a while. I now unplug the reader when not in use. XP can detect when a card is inserted and can be made to open a window or start an application if you wish. One word of warning with XP - do NOT insert the reader when the machine is running - XP hangs. The unit can be removed safely, with the machine running, by clicking on the remove hardware tray icon. From RedHat 7.3 drivers for this particular unit are included in the usb/usbstorage module. This is loaded auto-magically by the kernel hotplugger. The reader shows up as an extra SCSI disk and can be mounted using 'mount'. I found that the usbstorage driver would load before SCSI-IDE for my CD Writer, thus mixing up the SCSI ids (as they are generated not proper ids). There is no problem inserting/removing the reader whilst the machine is running, but note that the SCSI id will increment each time the unit is inserted. For those of you, like me, who build your own kernels, you need to build in SCSI support, otherwise it will not work.